Petrol, Beauty. Oxymoron? 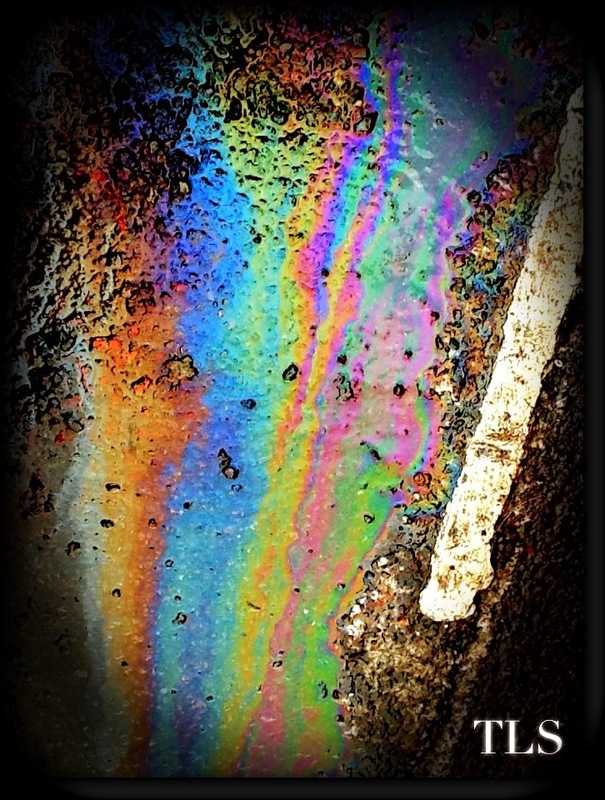 | details in the fabric..
A petrol leak in a car park on a rainy day. How can something so damaging to the environment, so harmful and poisonous, something that pollutes our world and condemns our future generations, how can something so awful be so… beautiful? Previous The Assassination of Radio. Next Versatility and Creativity Awards! Petrol just is what it is. It is not good or bad; it’s not even animate. Oil is naturally occurring. It’s our abuse of that is, well still not bad, just harmful. I love art like this — that sees the beauty in something so demonized, belittled or dismissed… Great photo! Great points! Never heard of Godwins law before – very interesting, and I’d say almost definitely true! Hitler always seems to crop up in conversation with me too, whenever I explain why I don’t eat meat and people disagree with me, I always get the “well Hitler was a vegetarian..” comment, haha. No way. I did not know Hitler was a vegetarian. That’s just… well the universe never gets tired of throwing up the most ridiculous surprises does it? TLS Hi, just wanted to mention, I enjoyed this post. It was practical. Keep on posting! TLS Hi there, just wanted to mention, I enjoyed this blog post. It was practical. Keep on posting!